Pinnacle Advanced Glass Cleaner equips the detailer with an effective solution to the constant war with glass clarity and cleanliness. Whether you're battling with exhaust film, insects, dirt, or smoker’s film, Pinnacle Advanced Glass Cleaner will quickly remove them and leave behind a perfectly clear glass surface. The ammonia free formula will ensure you never have to worry about streaks, smudges, or tint damage. The transparency of glass means that each and every speck, smear, and streak is visible from yards away! The constant battle with glass is made even worse by the fact that most product designed to clean this debris away will leave a streaky finish behind that is worse than the debris itself. Pinnacle Advanced Glass Cleaner was formulated specifically to avoid this common and annoying trait in glass cleaners. The main reason glass cleaners will cause streaks is due to the phosphates that are included in their formulas to control pH levels. Because Pinnacle Advanced Glass Cleaner does not include acidic properties, there is no need to include streak-creating phosphates to balance it out! 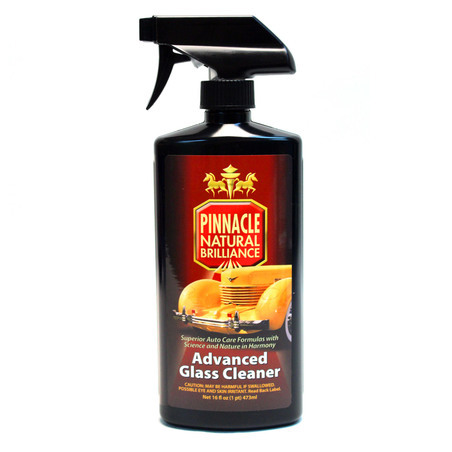 Pinnacle Advanced Glass Cleaner is an alcohol based cleaner, which offers multiple advantages when cleaning glass. The alcohol base of Pinnacle Advanced Glass Cleaner aids in breaking up the bonds between the contaminants that form exhaust and smoker’s film, making them easy to wipe away. The alcohol also ensures that the product evaporates quickly. The speedy evaporation of Pinnacle Advanced Glass Cleaner greatly reduces the occurrence of streaks and smudges! Another large concern most detailers have to consider when cleaning glass is the potential damage the cleaner could pose to any tinting that may have been done to the glass. Damage to tint is mainly caused by the ammonia that other cleaners use as a base in their formula. Ammonia, with repeated use, will cause your tint to bubble and peel away from the glass. Because Pinnacle Advanced Glass Cleaner is alcohol based and not ammonia based, it will not cause your tint to separate from your glass over time. For best results, have more than one glass towel on hand. 1. For exterior glass, spray Advanced Glass Cleaner directly onto the glass surface in an even layer. For interior surfaces, spray cleaner first onto towel before application. 2. Using a clean microfiber glass towel, spread the product over the surface to clean. 3. Flip your microfiber towel to a clean and dry side to buff away remaining product.